Home Laser TreatmentIs Cellulite Reduction Treatment Right for Me? Contrary to popular belief, not all problems need solving. You might have cellulite, but whether or not you should take steps to reduce it is entirely a different question. Several factors should go into whether cellulite reduction treatment is right for you. We’ll explore them in this post and tell you about some of the options that Weigh Less for Way Less offers for cellulite reduction if you decide to move forward with medical treatment. To Treat or Not To Treat Cellulite? Whether or not you pursue cellulite treatment depends on how much cellulite you have, and how much it bothers you. You might feel like you’re the only one who has it, but the exact opposite is true. In fact, according to the American Board of Cosmetic Surgery, about 85 to 90 percent of adult women have cellulite. With that in mind, think carefully about how much your cellulite impacts your daily life. Do you feel self-conscious in certain types of clothing Are you happy with how your body looks otherwise. How would getting rid of cellulite change your life? These are all questions to consider as you consider whether or not to make an effort to reduce your cellulite. The other factor to take into account is your current health. Generally speaking, you need to have good health before beginning any type of treatment option. If you are receiving medical treatment or are under doctor’s care for a long-term condition, please check with your physician before starting cellulite treatment. Does Losing Weight Affect Cellulite? Cellulite is often linked to excess body weight and body fat. Losing weight and burning excess body fat can help reduce the appearance of cellulite. Although it will not completely eliminate the problem. This is a good place to start before you invest in more invasive procedures. However, it is not a permanent solution because the cause of cellulite lies below the skin’s surface as muscles and fat separate. It’s a good idea to have a healthy diet and exercise anyway, but don’t expect it to eliminate your cellulite forever. Cellulite also becomes more prevalent as we age, so you will be fighting an uphill battle the older you get. There are also plenty of creams and related products that can help reduce the appearance of cellulite. Again, these are not meant to be permanent solutions. In the end, it all comes back to how comfortable you are with your body and how much of a problem cellulite is causing you. If diet and exercise changes can get rid of most of it and you’re happy with, great. If not, then it’s time to consider other treatment options. What is Laser Treatment for Cellulite Reduction? 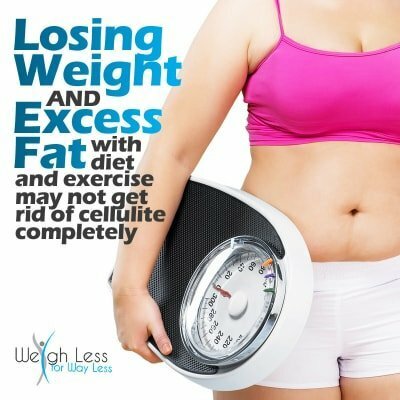 In addition to diet therapy and weight loss management services, Weigh Less for Way Less offers a unique treatment that can not only reduce cellulite but change the shape of your body. We use the latest in green laser technology to safely reduce cellulite, the Verju laser. The Verju laser system removes fatty lipids from fat cells, which causes them to become smaller. This sets the lymphatic system in motion to eliminate the fat that leads to cellulite and change your appearance. The fewer fat cells your body has, the less you weigh and the better your body looks. Not only are you losing weight, but you are also removing stubborn body fat that’s difficult to get to through diet and exercise changes alone. Verju treatment is done without needles or incisions, has little to no recovery time, and is 100 percent safe. While it is effective on its own, we recommend that Verju be used in conjunction with diet and exercise changes to attack cellulite from all angles and achieve the body you desire. No matter how much cellulite you would like to remove, Weigh Less for Way Less can help you evaluate treatment options to meet that goal. Contact us to learn more about the services we provide throughout the Chicago area at our 3 offices in Burr Ridge, Elmhurst, and Oak Lawn, IL. 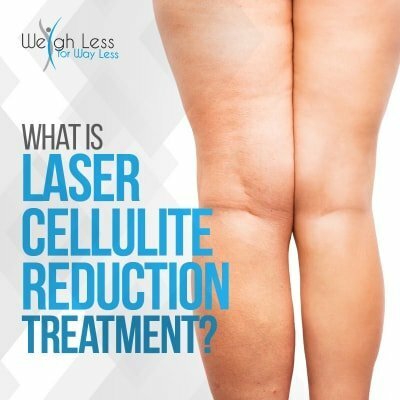 Have a?question about?Is Cellulite Reduction Treatment Right for Me? Join us in the comments! ?